Mass food or animal feed contamination hazards occur when food or food sources are contaminated with pathogenic bacteria, viruses, or parasites, as well as chemical or natural toxins. They may lead to foodborne illnesses and/or interruptions in the food supply. Contamination may occur due to natural foodborne illnesses and chemical, biological, radiological, or nuclear exposure. Most foodborne illnesses are caused by Campylobacter in poultry, E. Coli in beef, leafy greens, and raw milk, Listeria in deli meats, unpasteurized soft cheeses, and produce, Salmonella in eggs, poultry, meat, and produce, Vibrio in raw oysters, Norovirus in many foods, and Toxoplasma in meats (CDC, 2013). Contamination usually occurs accidentally during the production/preparation process but can also be the result of intentional acts. Pennsylvania is one of the nation’s leading agricultural producers with over 7,000 dairy farms, the highest concentration of snack food production in the country, and retail food establishments from corner convenience marts to farmers’ markets to large grocery store chains. In 2017, 26 people in Pennsylvania were infected with salmonella during a six-month span from handling live poultry (CDC 2017). A possible worst-case scenario would be if there was large-scale campylobacter or salmonella outbreak found in Pennsylvania’s poultry farms. An event like this would cause human suffering but would also have a crippling effect on the state’s poultry production and farm-based economy. The CDC estimates that one in six people gets sick from contaminated food each year, but those events are expected to be individualized and small in scope. The focus of this as a hazard is on large-scale contamination and illness. With the aggressive testing and food safety outreach the Department of Agriculture conducts, the overall probability of a mass food or animal feed contamination event is unlikely. 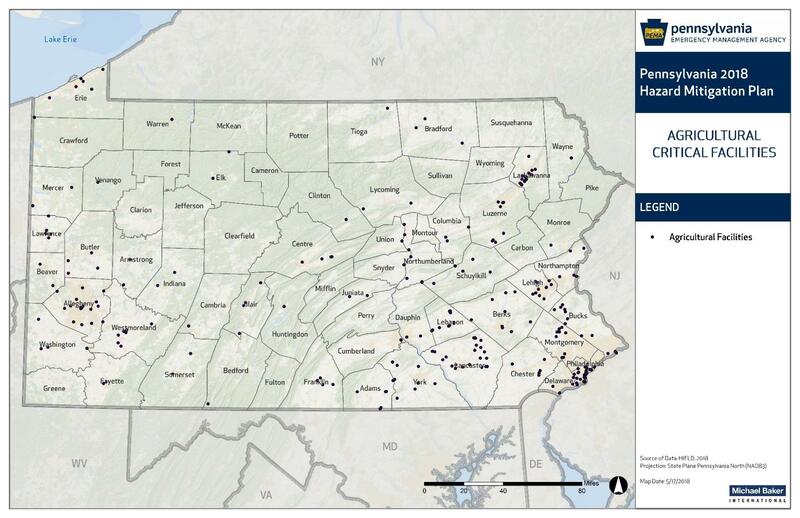 Distribution of agricultural critical facilities throughout Pennsylvania (HIFLD, 2018).